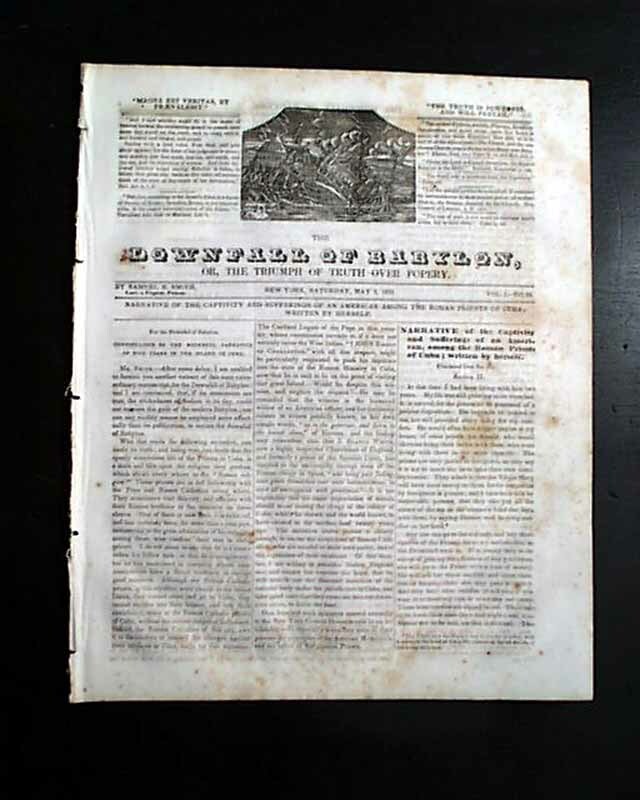 A quite rare & unusual weekly (later semi-monthly) newspaper with strong anti-Catholic leanings published by: "Samuel B. Smith, Late a Popish Priest", as noted in the dateline. 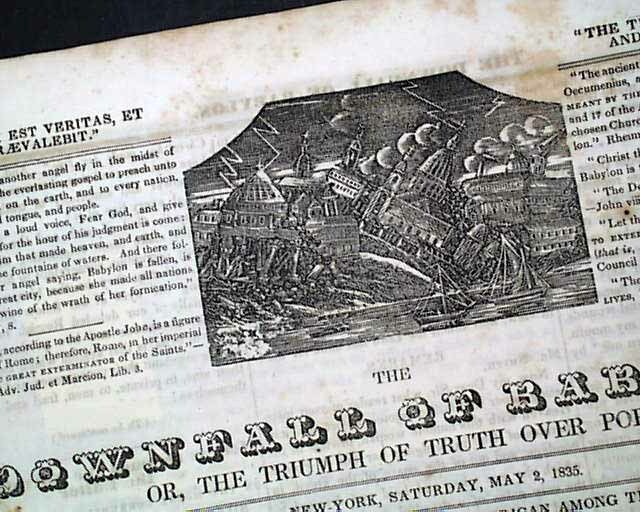 This newspaper published from 1834-1839 & features an engraving in the masthead showing various churches in ruin (see) and a subtitle: "Or, the Triumph of Truth Over Popery". The ftpg. 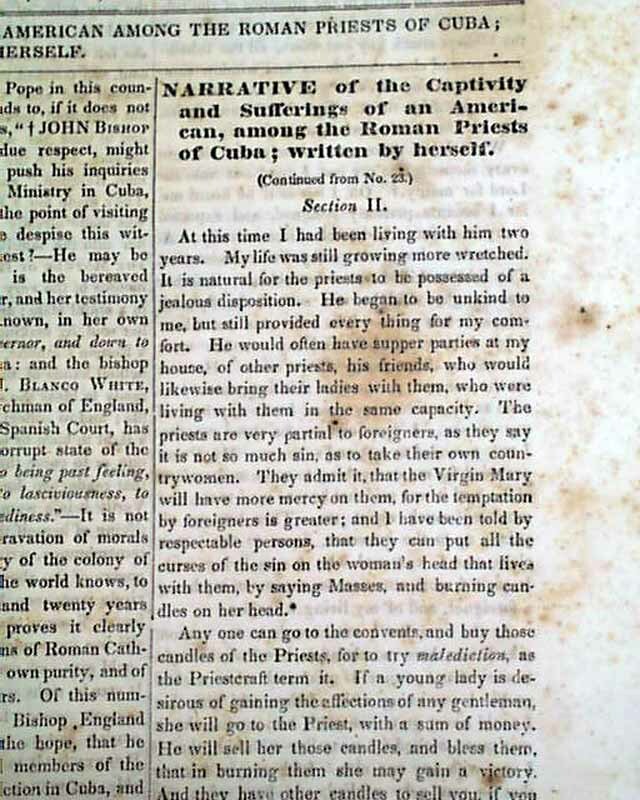 has: "Continuation of the Mournful Narrative of Five Years in the Island of Cuba" and: "Narrative of the Captivity & Sufferings of an American, Among the Roman Priests of Cuba..." which carries over t pg. 2. 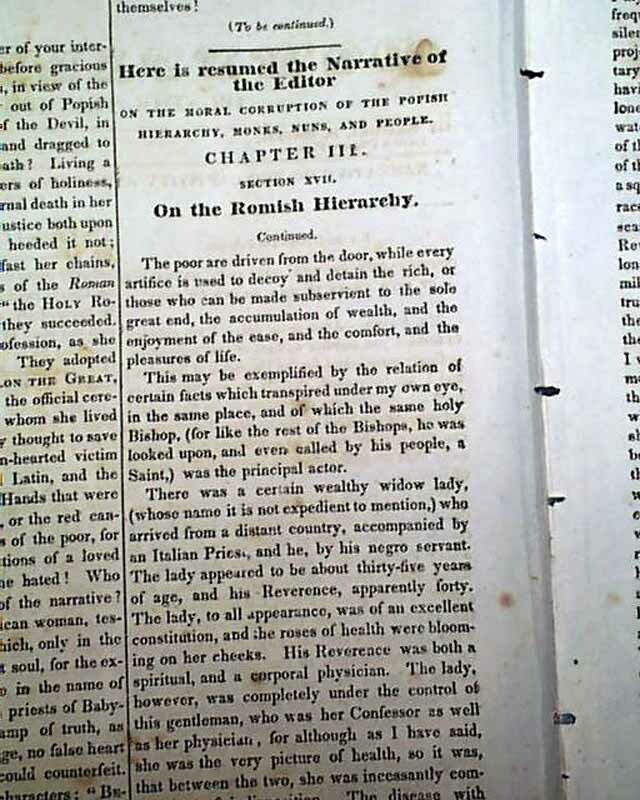 And then: "On the Moral Corruption of the Popish Hierarchy, Monks, Nuns, and People", a continuing article. One of the more sensational stories exploited in later issues of this newspaper was "The Awful Disclosures of Maria Monk", a story of a nun which revealed that the nunnery at the Hotel Dieu in Montreal was little more than a harem for the use of the local priesthood. Maria Monk's story was filled with sensational detail of secret entrances, underground tunnels, prisons & even a mass grave for the babies born of illicit liaisons. Her eventual escape from the nunnery allowed her to tell the story. But her story was entirely untrue, & Maria Monk had very little to do with writing it. Works of anti-Catholic literature were widely available in the first half of the 19th century. When Maria Monk's book was published it met an audience that was predisposed to accept the fantastic story she presented. Ultimately contradictions and falsehoods were discovered that proved her story to be a hoax. Complete in four pages, 10 by 12 inches, nice condition.